Yazmin Watkins blushes and laughs along with the rest of the cast and crew. She’s good at taking a joke, which might as well be part of her job description. As the environmental steward for the film, she’s the person responsible for reducing the amount of waste produced on set and cutting down on the energy, water, and other natural resources that go into production -- not an easy task on a project with a reported $40 million budget that involves months of shooting and thousands of cast and crew members. Her job starts several weeks before any filming begins, giving her time to hunt down and hire green vendors, such as waste haulers that are willing to transport compost and caterers who cook with organic ingredients. 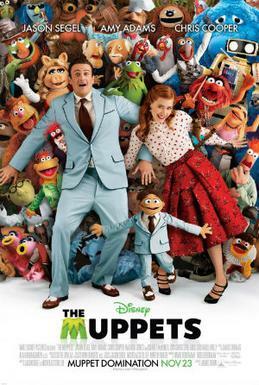 She meets with each department, such as wardrobe, construction, and locations, to discuss the most environmentally friendly choices for the film. On set, she refills reusable water bottles for the puppeteers -- a task that would usually fall to a low-level production assistant, but that Watkins gladly takes on so that no one will be tempted to drink from a plastic bottle and toss it in the trash. 49 penguins, that were affected by the NZ oil spill, were released into the ocean by the wildlife rescuers recently. These penguins were washed ashore nearly dead and blackened by oil. Fortunately wildlife rescuers were on hand to help them, meticulously scrubbing clean their feathery coats and nursing them back to health with devotion befitting of such beloved birds. But now, after nearly two months on the mend and before hundreds of eager spectators, 49 little penguins finally made their way delightedly back to sea. Watch them as they return to their habitat joyfully! 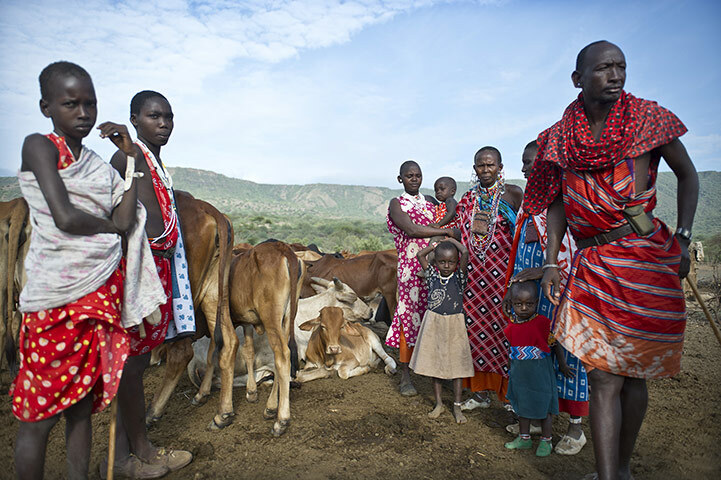 Masai living in Kojiado district, near the Tanzanian border, are finding traditional cattle herding harder because the weather is getting hotter and the rain more unpredictable. Pasture is becoming harder to find, so many are diversifying to grow crops as well or turning to farming full--time. They are also working with traditional farmers to ensure that both lifestyles can share the resources available without encroaching on each other's survival. Sending children to school is also becoming a priority so that they are better equipped for their changing world. The internet is a place where you'll find tons of like-minded people. Don't believe us? Ask that one guy who's obsessed with Elvis' shades. He now has a Facebook fan page of 250 members who share their love of the icon's goggles! 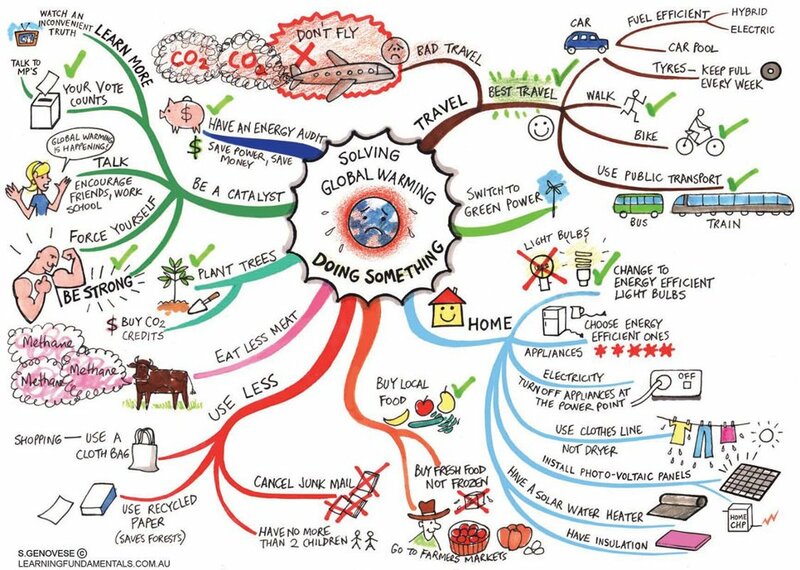 So, coming back to the point, we were surfing the web and during this random surfing session, we came across 5 awesome blogs on sustainability. Here they are: http://p1n.in/tq8. You should follow them too! 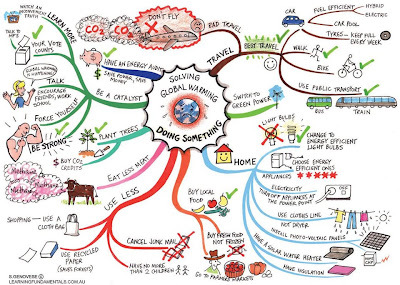 This cool info graphic via Climate Action shows us the way to reduce our carbon footprint. Share it forward and let your friends learn from it too! The focus on incorporating sustainable business practices is gaining importance. While many companies desire to become ‘sustainable’, the underlying issues related to data collection, management, analysis and reporting are critical areas where IT can play a significant role. SAP offers solutions to strengthen sustainability initiatives of companies. On November 3, SAP announced that Atos, an international IT services company, like many of SAP’s sustainability partners, is “walking the walk” with SAP sustainability solutions. In light of this, ThinktoSustain.com speaks to Scott Bolick, Vice President, Sustainability Solutions, SAP, to get an insight into how its efforts are helping businesses achieve their sustainability goals. What are the opportunities where IT can play a significant role in addressing sustainability? sustainable supply chain and products. How do SAP sustainability solutions enhance capabilities of your customers to address sustainability issues? Scott Bolick: Our solutions help SAP and non-SAP customers gain better insight into their operations, performance and compliance with sustainability initiatives and regulations. For example, if a manufacturer is committed to becoming more sustainable across its operations, SAP can help that company to monitor, analyze and report on their sustainability performance towards specific goals – as well as proactively identify when to take corrective actions when they are going off track. SAP can also help all manufacturers - heavy industry, consumer product and discrete manufacturing – ensure product safety and that products do not contain materials banned by regulations like RoHS (Restriction of Hazardous Substances) or REACH (Regulation on Registration, Evaluation, Authorisation and Restriction of Chemicals). We can also help customers “green” their supply chain by evaluating the waste in their supply chain and ensuring that all products and processes are environmentally friendly. It is fashionable to argue that a new climate treaty, based on the Kyoto architecture of legally binding carbon caps, is dead. We should, on this view, give Kyoto a decent burial and switch to plan B. This turns out to be a looser arrangement in which governments make voluntary pledges to each other. Its advocates often call themselves "realists". The case for voluntarism was first put by those who want to try less hard to deal with climate change. It has subsequently attracted support from academics and other commentators whose concern – indeed alarm – about the climate is unquestionable. They may be desperate rather than cynical, but they tend to know more about the climate than they do about diplomacy. The problem is in the politics not the architecture. The choice between what needs to be done but looks impossible, and what can be done but is clearly not enough, is as old as history. It lay behind the struggle between Churchill and Halifax as Britain faced Hitler's tanks on the Channel coast. Nato's success in Libya was conducted against a barrage of predictions that it would lead to years of stalemate. When there is no alternative, realism lies in expanding the limits of the possible, not in nourishing the delusion that something else might help. There really is no plan B for the climate. A voluntary framework will not be enough to keep us within the 2C limit of manageable climate change. Unmanageable climate change will precipitate systemic collapses, including of our food and water security. Success or failure will depend on governments convincing investors that they are determined to enact the policies necessary to drive private capital towards a low-carbon future. In the boardroom a voluntary pledge from a government sounds rather like "maybe". That's why in the UK we have set legally binding carbon budgets through the Climate Change Act. A group of spoon-billed sandpipers has arrived in the UK as part of a captive breeding programme to bring the bird back from the brink of extinction. The 13 young birds have arrived at the Wildfowl and Wetlands Trust's (WWT) centre at Slimbridge, Gloucestershire, in the final leg of an epic journey which has brought them from the species' Russian breeding grounds. The birds were collected as eggs in Russia as conservationists from WWT, Birds Russia and the RSPB mounted an emergency rescue mission, before being hatched in captivity and kept in quarantine for a month in Moscow zoo. They have now been flown to the UK and taken to Slimbridge, where they will spend another 30 days in quarantine, to form the basis of a captive breeding programme. The critically endangered spoon-billed sandpiper, one of the world's rarest birds, had seen its population fall to an estimated 120-200 pairs in the wild by 2009. 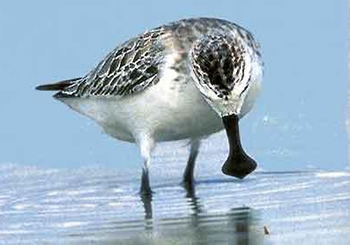 Numbers are thought to be declining by around a quarter each year owing to very low survival rates of juvenile spoon-billed sandpipers and conservationists warn the bird could go extinct within a decade without swift action to help it. 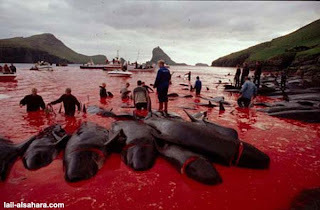 Whaling in the Faroe Islands in Denmark has been practiced since about the time of the first Norse settlements on the islands. It is regulated by Faroese authorities but not by the International Whaling Commission as there are disagreements about the Commission's competency for small cetaceans. Around 950 Long-finned Pilot Whales (Globicephala melaena) are killed annually, mainly during the summer. The hunts, called "grindadráp" in Faroese, are non-commercial and are organized on a community level; anyone can participate. The hunters first surround the pilot whales with a wide semicircle of boats. The boats then drive the pilot whales slowly into a bay or to the bottom of a fjord. Most Faroese consider the hunt an important part of their culture and history. Animal-rights groups criticize the hunt as being cruel and unnecessary. As of the end of November 2008 the chief medical officers of the Faroe Islands have recommended that pilot whales no longer be considered fit for human consumption because of the levels of toxins in the whales. It seems a bit unnecessary to rip an animal apart for male bravado. By the year 2050, nearly 80% of the earth's population will reside in urban centers. Applying the most conservative estimates to current demographic trends, the human population will increase by about 3 billion people during the interim. An estimated 109hectares of new land (about 20% more land than is represented by the country of Brazil) will be needed to grow enough food to feed them, if traditional farming practices continue as they are practiced today. At present, throughout the world, over 80% of the land that is suitable for raising crops is in use (sources: FAO and NASA). Historically, some 15% of that has been laid waste by poor management practices. What can be done to avoid this impending disaster? Vertical farming is a concept that argues that it is economically and environmentally viable to cultivate plant or animal life within skyscrapers, or on vertically inclined surfaces. The world is likely to build so many new fossil-fuelled power stations, energy-guzzling factories and inefficient buildings in the next five years that it will become impossible to hold global warming to safe levels, and the last chance of combating dangerous climate change will be "lost for ever", according to the most thorough analysis yet of world energy infrastructure. Anything built from now on that produces carbon will continue to do so for decades to come, and this "lock-in" effect will be the single factor most likely to produce irreversible climate change, the world's foremost authority on energy economics has found. If this infrastructure is not rapidly changed within the next five years, the results are likely to be disastrous. "The door is closing," Fatih Birol, chief economist at the International Energy Agency, told the Guardian. "I am very worried – if we don't change direction now on how we use energy, we will end up beyond what scientists tell us is the minimum [for safety]. The door will be closed forever." Every month now counts: if the world is to stay below 2C of warming, which scientists regard as the limit of safety, then emissions must be held to no more than 450ppm of carbon dioxide in the atmosphere; the level is currently around 390ppm. But the world's existing infrastructure is already producing 80% of that "carbon budget", according to a new analysis by the IEA, published on Wednesday. 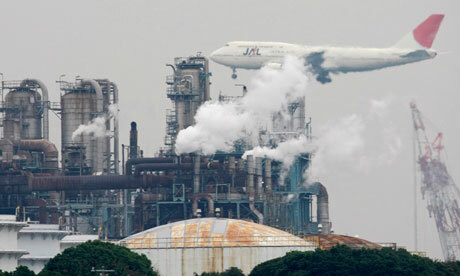 This gives an ever-narrowing gap in which to reform the global economy on to a low-carbon footing. If current trends continue, and we go on building high-carbon energy generation, then by 2015 at least 90% of the available "carbon budget" will be swallowed up by our energy and industrial infrastructure. By 2017, there will be no room for manoeuvre at all – the whole of the "carbon budget" will be spoken for, according to the IEA's calculations. It looks like risky politics for Jairam Ramesh, who runs India’s biggest civilian ministry, in charge of rural development, to lash out at his own government’s flagship welfare scheme. Mr Ramesh, who got his cabinet post in July, has sparked a row in the past week over corruption and poor results within a public programme that guarantees 100 days of paid work a year for any unskilled rural labourer who wants it. Sadly, he is only stating the obvious. India’s biggest single welfare project was launched in 2006 and costs over $8 billion a year. Alone, it eats up over 3% of all public spending, and officials say over 50m households last year got some benefit from it. Supporters say it has helped to lift rural wages—on average workers get about 120 rupees ($2.40) a day—which should mean falling poverty. But in many districts, especially poorer ones, huge amounts are stolen or wasted. In his office in Delhi, listening to Vivaldi, Mr Ramesh criticises “uneven, patchy” implementation of the scheme. He complains about months-long delays in getting workers paid. And he describes wasteful construction of items such as roads that quickly crumble away. The results, in many areas, fall short of the huge sums spent. Mr Ramesh says he has written furiously to all the states’ chief ministers to highlight the deficiencies. Too much money ends up in crooked officials’ pockets. The gloomiest estimates, such as one by Surjit Bhalla, a prominent economist, suggest two-thirds of funds might be squandered. That looks extreme, but abuse can be crass. In Gonda, a sugar- and rice-farming district in eastern Uttar Pradesh, an anti-graft campaigner, Brijesh Pandey, claims he has tracked how “ongoing scams” divert a quarter of the jobs funds. Common complaints are of officials who pocket wages signed out for non-existent workers. Washington, D.C. - As the global population surpassed 7 billion people sometime around the end of October, addressing the challenges associated with a still-growing world population will require a two-pronged response, according to experts with the Worldwatch Institute. The combined measures of empowering women to make their own decisions about child-bearing and significantly reducing global consumption of energy and natural resources would move humanity toward rather than further away from environmentally sustainable societies that meet human needs. Stuart Levy once kept a flock of chickens on a farm in the rolling countryside west of Boston. No ordinary farmer, Levy is a professor of molecular biology and microbiology and of medicine at Tufts University School of Medicine. This was decades ago, and his chickens were taking part in a never-before-conducted study. Half the birds received feed laced with a low-dose of antibiotics, which U.S. farmers routinely administer to healthy livestock -- not to cure illness, but merely to increase the animals’ rates of growth. The other half of Levy’s flock received drug-free food. Results started showing up almost instantly. Within two days, the treated animals began excreting feces containing E. coli bacteria that were resistant to tetracycline, the antibiotic in their feed. (E. Coli, most of which are harmless, normally live in the guts of chickens and other warm-blooded animals, including humans.) After three months, the chickens were also excreting bacteria resistant to such potent antibiotics as ampicillin, streptomycin, carbenacillin, and sulfonamides. Even though Levy had added only tetracycline to the feed, his chickens had somehow developed what scientists now call "multi-drug resistance" to a host of antibiotics that play important roles in treating infections in people. More frightening, although none of the members of the farm family tending the flock were taking antibiotics, they, too, soon began excreting drug-resistant strains of E. coli. When Levy’s study was published in The New England Journal of Medicine in 1976, it was met with skepticism. "The other side -- industry -- could not believe that this would have happened. The mood at the time was that what happens in animals does not happen in people," said Levy, who serves as president of the Alliance for the Prudent Use of Antibiotics, in a telephone interview from his office at Tufts. "But we had the data. It was obvious to us even then that using antibiotics this way was an error and should be stopped." During the intervening 35 years, study after study has confirmed Levy’s findings and shown that the problem of antibiotic-resistant "superbugs" is even worse than anyone could have imagined. Each year, 70,000 Americans in U.S. hospitals die from bacterial infections that drugs are unable to kill. And even as the number of infectious diseases is on the rise, more antibiotics are administered to livestock than ever before, from 17.8 million pounds per year in 1999 according to the Animal Health Institute (a trade organization of companies, like Bayer, Novartis, and Pfizer, that manufacture livestock drugs) to 29.8 million pounds in 2009, according to the U.S. Food and Drug Administration, or FDA. Fully 80 percent of the antibiotics used in the United States are given to livestock, and the vast majority are administered to promote growth and stave off potential infections, not to treat illness. The population count is now at 7 billion. 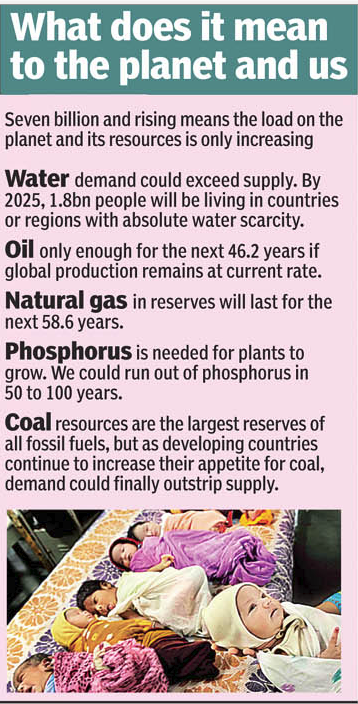 An article in the DNA, an Indian newspaper, tells us the negatives of overpopulation!